In 2018, the US Secretary of Commerce initiated a Section 232 investigation into foreign uranium imports and their effect on national security. 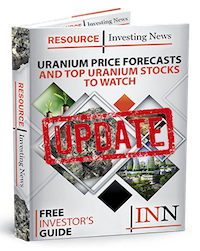 The issue was raised by Energy Fuels (TSX:EFR,NYSEAMERICAN:UUUU) and Ur-Energy (TSX:URE,NYSEAMERICAN:URG) — US-based miners concerned that uranium sourced from around the world may be of inferior quality and could pose a national security risk. On Sunday (April 14), the US Department of Commerce submitted a report on its investigation to the White House, leaving President Donald Trump 90 days to respond to its recommendations. Part of the discussion around Section 232 entails the US implementing a 25 percent domestic quota on all uranium used in the country. At the 2019 Prospectors & Developers Association of Canada (PDAC) convention, held in March, the Investing New Network (INN) spoke with Energy Fuels, IsoEnergy (TSXV:ISO,OTCQX:ISENF) and NexGen Energy (TSX:NXE,NYSEAMERICAN:NXE), as well as industry experts Nick Carter of UxC and Mercenary Geologist Mickey Fulp, to find out how the investigation has impacted the uranium sector and what the decision could ultimately mean for the market in the US and abroad. Editorial Disclosure: Energy Fuels and IsoEnergy are clients of the Investing News Network. This article is not paid-for content. Great report from PDAC on the possible impact of the US 232 Investigation! Really good to see somebody who is interested in gathering information and trying to explain the objective truth behind all this!